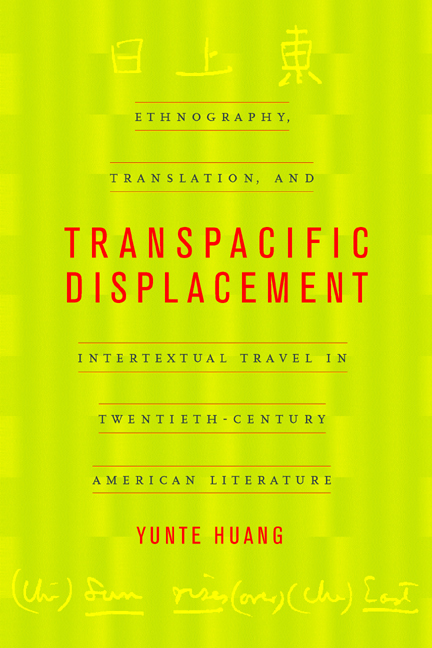 Yunte Huang takes a most original "ethnographic" approach to more and less well-known American texts as he traces what he calls the transpacific displacement of cultural meanings through twentieth-century America's imaging of Asia. Informed by the politics of linguistic appropriation and disappropriation, Transpacific Displacement opens with a radically new reading of Imagism through the work of Ezra Pound and Amy Lowell. Huang relates Imagism to earlier linguistic ethnographies of Asia and to racist representations of Asians in American pop culture, such as the book and movie character Charlie Chan, then shows that Asian American writers subject both literary Orientalism and racial stereotyping to double ventriloquism and countermockery. Going on to offer a provocative critique of some textually and culturally homogenizing tendencies exemplified in Maxine Hong Kingston's work and its reception, Huang ends with a study of American translations of contemporary Chinese poetry, which he views as new ethnographies that maintain linguistic and cultural boundaries. Yunte Huang, Assistant Professor of English and American Literature and Language at Harvard University, is the author of Shi: A Radical Reading of Chinese Poetry and the translator into Chinese of Ezra Pound's Cantos. 2. Ezra Pound: An Ideographer or Ethnographer?